Since bursting onto the scene as the Fantastic Four's most menacing villain, Doctor Victor Von Doom has incited terror across the Marvel U. Discover the Master of Dark Arts, the Lord of Latveria, with our selection of must-read picks. Doctor Doom's first appearance. The Invisible Woman is spirited away to the Fortress of Doom. Who is the Dark Sorcerer holding her captive? And why is he targeting the Fantastic Four? Doom becomes the ultimate party crasher when he hijacks a function at the Avengers' headquarters. The party games continue when Doom reveals he is wired with a neutron bomb! 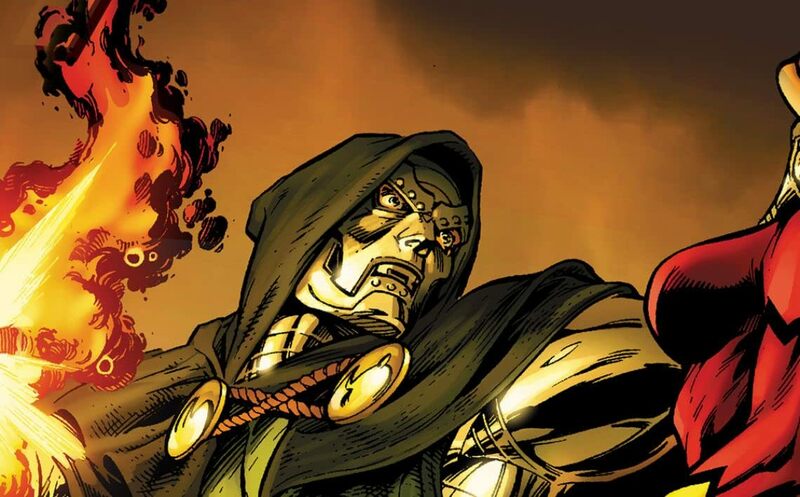 Will the Avengers deactivate Doom before it's too late? Upon discovering unauthorized tech shipments to Latveria, Iron Man heads to Doom's country to investigate. Will tyrannical Doctor Doom play by the rules of international diplomacy? The most pivotal battle in the Secret Wars event! Doctor Doom absorbs the power of the Beyonder, a cosmic overlord pitting heroes and villains against each other. Witness a new incarnation of Doom, gigantic in both size and ego. In an act of retaliation, Doom coerces Gray Hulk into attacking the Thing. With Doc Doom in charge, this is a clobbering unlike anything you've seen! The secret of Kristoff Vernard, heir to Latveria, revealed. Writer Ed Brubaker envisions the history and rise of Doom, as told through his memoirs. In the first issue, we meet the young Romani boy who will come to be King of Latveria. How did Victor's gypsy roots influence his reign as Marvel's most notorious villain? The Mighty Avengers invade Latverian soil after America is threatened with chemical attack. But are the orders really coming from Doom? The romantic side to Von Doom revealed in his time-traveling tryst with Morgan Le Fay! Doctor Doom joins the Cabal, a secret order of Marvel's most manipulative villains. Who extended Doom's bid for membership? Plus, Victor Von Doom does dinner with Loki, and the topic of conversation is anything but polite. Wakanda stands defeated at the hands of Doom. The country's precious vibranium has been plundered, and Storm, Queen of Wakanda, faces execution. Will Marvel's finest heroes be able to save Wakanda from imminent Doom? The first issue in a 6-part event! By the powers of Scarlet Witch, Doctor Doom is transformed into a godlike being. But when Doom tries to play God and monarch, the Avengers must take him out! A tragic ending in the penultimate issue to Children's Crusade. Doctor Doom has surrendered to the Fantastic Four, and the team is up in arms. Why is Victor seeking aid from his sworn enemies? And how does his adoptive son Kristoff fit into the equation? Doctor Doom vs. the Future Foundation! Will the Fantastic Four's youngest students be able to escape Doom's virtual reality? It's anything but fun and games, as the FF do battle for their lives. Guest-starring Julius Caesar!